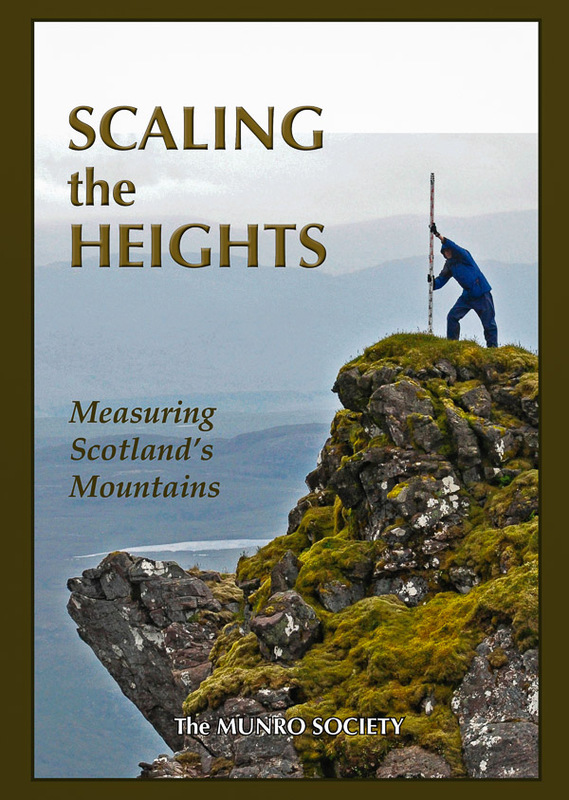 The Fours are the English hills at or above 400m and below 500m in height that have a minimum drop of 30m. The list’s initial compilation was completed in November 2002 and entitled The 400m Peaks of England and was first published on 19th December 2002 on the RHB Yahoo Group file database along with the equivalent Welsh and Manx hills, with the file entitled the 400m hills of England, Isle of Man and Wales, this file was uploaded by Rob Woodall who later augmented data from Clem Clements into the database. The original publication on the RHB Yahoo Group file database was later duplicated en masse by Mark Jackson without prior consultation with, or even notification to the author, with these data forming the equivalent part of the Tumps and with this act resulting in years of undue data divergence that is ongoing. Over subsequent years the listing now known as The Fours has been published on the Europeaklist website (15th December 2013) available as a downloadable e-booklet and print-booklet version and on the Haroldstreet website (6th January 2014) available as GPS Waypoints, Google mapping and online hill bagging tick lists. The original compilation included a sub-list of hills entitled ‘Hills to be surveyed’ which was later re-evaluated and included in the Europeaklist and Haroldstreet publications. This sub list comprised all hills identified from map study that were at or above 400m and below 500m in height and if surveyed for drop stood a chance of qualifying for the main P30 list. At the time of compilation the spot heights on Ordnance Survey maps were taken at face value as the margin of uncertainty applicable to the surveying method that ascertained them was unknown at the time. Therefore if a hill was given a drop value of 29m from its summit and col spot heights it was not included in this ‘Hills to be surveyed’ sub list as it was deemed not to warrant a survey for inclusion into the main P30 list as the map had given it 29m of drop. This sub list has now been standardised and comprises all English hills that are at or above 400m and below 500m in height and have 20m or more and below 30m of drop, the name of this sub list is the 400m Sub-Fours. It wasn’t until the interest shown by Mark Trengove for this list to be published by Europeaklist that the 400m Sub-Fours were fully re-evaluated, with the subsequent publication on 15th December 2013 entitled The Fours and leading the way to the list becoming co-authored with Aled Williams. After the 6th January 2014 publication of The Fours by Phil Newby on his Haroldstreet website all future updates to the list have been catalogued on the Mapping Mountains site. Since its original publication The Fours has changed greatly as the list is now co-authored with Aled Williams, and although the criteria has remained the same for the main P30 list, the criteria for the 400m Sub-Fours has now been standardised, and the numerical data benefits from the advent of accurate surveys conducted with GPS / GNSS receiver, an expanded range of Ordnance Survey maps available online and most recently, by analysis of LIDAR data enabling greater accuracy for numerical data. However, it is not just numerical data that has seen this list develop since its first inception, it is also place-name data, and it was because of this and their mutual interest in hill lists that the authors first corresponded. The listing is also gaining in popularity as there are now two known completers of The Fours with another 38 people having completed 100 or more of these hills. It seems fitting that the list of The Fours – The 400m Hills of England – 400m Sub-Fours should now benefit from a detailed Change Register, and although the updates to this list have been catalogued since its first inception in 2002, it is prudent for this Change Register to initially detail the changes to this sub list since the December 2013 publication by Europeaklist. 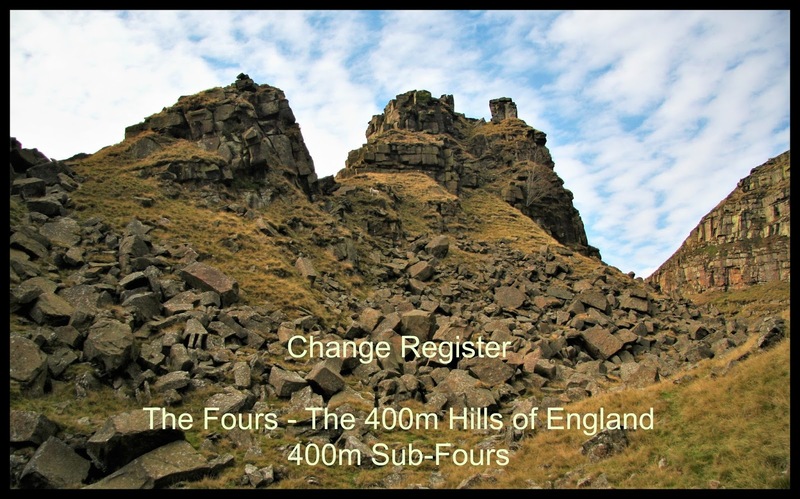 The Change Register to The Fours – The 400m Hills of England – 400m Sub-Fours appears below with the reclassifications to the list being detailed chronologically in receding order. The addition of this hill to 400m Sub-Four status was announced when Mapping Mountains Publications published the 2nd edition of The Fours on the 24.04.18, with a Hill Reclassifications post appearing on Mapping Mountains on the 23.03.19, the hill was previously listed with c 17m of drop based on interpolation of 10m contours for both summit and col with an estimated c 422m summit height and an estimated 405m col height. This hill’s addition is due to LIDAR analysis conducted by Myrddyn Phillips resulting in a 421.85m summit height and a 400.4m col height, with these values giving this hill 21.5m of drop, which is sufficient for it to be classified to 400m Sub-Four status. 400m Sub-Four total increases by one and confirmed as 151. The addition of this hill to 400m Sub-Four status was announced when the 2nd edition of The Fours was published by Mapping Mountains Publications on the 24.04.18, with a Hill Reclassifications post then being published on Mapping Mountains on the 11.10.18. The hill was previously listed with c 18m of drop based on the 414m summit spot height that appears on the Ordnance Survey 1:25,000 Explorer map and an estimated col height of c 396m based on col contouring at 5m intervals and between 395m – 400m on the 1:25,000 Explorer maps, however as the contours at this hill’s col are on land that is now a part of a railway cutting the contours on the 1:25,000 map although continuous do not show sufficient detail to take in the depth of this cutting. This hill’s addition is due to analysis of data on the OS Maps website, which is the recent replacement for OS Get-a-map. This mapping has 5m contour intervals enabling the estimated height of the col to be narrowed down when compared to the perceived lack of detail on the 1:25,000 map, and with an estimated col height of c 389m, based on contours between 385m – 390m, these values give this hill c 25m of drop, which is sufficient for its inclusion as a 400m Sub-Four. 400m Sub-Four total increases by one and confirmed as 150. The announcement of this hill’s deletion from 400m Sub-Four status was announced when the 2nd edition of The Fours was published by Mapping Mountains Publications on the 24.04.18, with a Hill Reclassifications post then being published on Mapping Mountains on the 21.09.18. The hill was previously listed with c 22m of drop based on the 405m summit spot height that appears on the Ordnance Survey 1:25,000 Explorer map and an estimated col height of c 383m based on col contouring at 5m intervals and presumed between 380m – 385m on the 1:25,000 Explorer map. However, as the col of this hill is situated on land that is a part of the Hillhead Quarry these contours are not continuous; therefore the previously listed drop value was always under scrutiny. This hill’s deletion is due to analysis of data on the OS Maps website, which is the recent replacement for OS Get-a-map, this mapping has 5m contour intervals that are continuous and with an estimated col height of c 386m, based on contours between 385m – 390m, these values give this hill c 19m of drop, which is insufficient for its continued inclusion as a 400m Sub-Four. 400m Sub-Four total decreases by one and confirmed as 149. This is an artificial hill and its inclusion as a 400m Sub-Four was announced when the 2nd edition of The Fours was published by Mapping Mountains Publications on the 24.04.18, with a Hill Reclassifications post then being published on Mapping Mountains on the 14.09.18. This hill’s inclusion in this sub category is due to analysis of 5m contour intervals available on the OS Maps website, which is the recent replacement for OS Get-a-map, coupled with analysis of imagery on Google Maps as well as Google Earth resulting in this hill being considered solid and stable. With OS Maps giving this hill an uppermost 410m ring contour and col contouring between 390m – 395m, resulting in an estimated summit height of c 412m and an estimated col height of c 392m, with these values giving this hill c 20m of drop which is sufficient for it to be listed as a 400m Sub-Four. 400m Sub-Four total increases by one and confirmed as 150. This is an artificial hill and its inclusion as a 400m Sub-Four was announced when the 2nd edition of The Fours was published by Mapping Mountains Publications on the 24.04.18, with a Hill Reclassifications post then being published on Mapping Mountains on the 25.08.18. This hill’s inclusion in this sub category is due to analysis of 5m contour intervals available on the OS Maps website, which is the recent replacement for OS Get-a-map, coupled with analysis of imagery on Google Maps as well as Google Earth resulting in this hill being considered solid and stable. OS Maps give the hill an uppermost 410m ring contour and col contouring between 385m – 390m, resulting in an estimated summit height of c 410m and an estimated col height of c 387m, with these values giving this hill c 23m of drop which is sufficient for it to be listed as a 400m Sub-Four. 400m Sub-Four total increases by one and confirmed as 149. This is an artificial hill and its inclusion as a 400m Sub-Four was announced when the 2nd edition of The Fours was published by Mapping Mountains Publications on the 24.04.18, with a Hill Reclassifications post then being published on Mapping Mountains on the 20.08.18. The inclusion of this hill in this sub category is due to analysis of the 5m contour intervals available on the OS Maps website, which is the recent replacement for OS Get-a-map, coupled with analysis of imagery on Google Maps as well as Google Earth resulting in this hill being considered solid and stable. OS Maps give the hill an uppermost 415m ring contour and col contouring between 385m – 390m, resulting in an estimated summit height of c 416m and an estimated col height of c 388m, with these values giving this hill c 28m of drop which is sufficient for it to be listed as a 400m Sub-Four. 400m Sub -Four total increases by one and confirmed as 148. This is an artificial hill and its inclusion as a 400m Sub-Four was announced when the 2nd edition of The Fours was published by Mapping Mountains Publications on the 24.04.18, a Hill Reclassifications post was then published on Mapping Mountains on the 15.08.18. This hill’s inclusion in this sub category is due to analysis of the 5m contour intervals on the OS Maps website, which is the recent replacement for OS Get-a-map, coupled with analysis of imagery on Google Maps as well as Google Earth resulting in the conclusion that this hill is solid and stable. OS Maps give the hill two uppermost 425m contours and col contouring between 395m – 400m, resulting in an estimated summit height of c 426m and an estimated col height of c 397m, with these values giving this hill c 29m of drop which is sufficient for it to be listed as a 400m Sub-Four. 400m Sub-Four total increases by one and confirmed as 147. The addition of this hill to 400m Sub-Four status was announced when the 2nd edition of The Fours was published by Mapping Mountains Publications on the 24.04.18, with the Hill Reclassifications post then published on Mapping Mountains on the 10.08.18, the hill was previously listed with c 16m of drop based on the 484m summit spot height that appears on the Ordnance Survey 1:25,000 Explorer map and an estimated col height of c 468m based on col contouring at 10m intervals and between 460m – 470m on the 1:50,000 Landranger and 1:25,000 Explorer maps. This hill’s addition is due to analysis of data on the OS Maps website, which is the recent replacement for OS Get-a-map. This mapping has 5m contour intervals enabling the estimated height of the col to be narrowed down, and with an estimated col height of c 464m, based on contours between 460m – 465m, these values give this hill c 20m of drop, which is sufficient for its inclusion as a 400m Sub-Four. 400m Sub-Four total increases by one and confirmed as 146. The 400m Sub-Four status of this hill was deleted and announced when the 2nd edition of The Fours was published by Mapping Mountains Publications on the 24.04.18, with the post relating to its Hill Reclassification being published on Mapping Mountains on the 05.08.18, the hill was previously listed with c 20m of drop based on the 454m summit spot height that appears on the Ordnance Survey 1:25,000 Explorer map and an estimated col height of c 434m based on col contouring at 10m intervals and between 430m – 440m on the 1:50,000 Landranger and 1:25,000 Explorer maps. This hill’s deletion is due to analysis of data on the OS Maps website, which is the recent replacement for OS Get-a-map. This mapping has 5m contour intervals enabling the estimated height of the col to be narrowed down, and with an estimated col height of c 437m, based on contours between 435m – 440m, these values give this hill c 17m of drop, which is insufficient for its continued inclusion as a 400m Sub-Four. 400m Sub-Four total decreases by one and confirmed as 145. This hill’s deletion from 400m Sub-Four status was announced when the 2nd edition of The Fours was published by Mapping Mountains Publications on the 24.04.18, with a Hill Reclassifications post appearing on Mapping Mountains on the 30.07.18, the hill was previously listed with c 20m of drop based on the 446m summit spot height that appears on the Ordnance Survey 1:50,000 Landranger and 1:25,000 Explorer map and which is given to a triangulation pillar, and an estimated col height of c 426m based on col contouring at 10m intervals and between 420m – 430m on the 1:50,000 Landranger and 1:25,000 Explorer maps. This hill’s deletion is due to analysis of data on the OS Maps website, which is the recent replacement for OS Get-a-map. This mapping has 5m contour intervals enabling the estimated height of the col to be narrowed down, and with an estimated col height of c 428m, based on contours between 425m – 430m, these values give this hill c 18m of drop, which is insufficient for its continued inclusion as a 400m Sub-Four. 400m Sub-Four total decreases by one and confirmed as 146. The deletion of this hill from 400m Sub-Four status was announced when the 2nd edition of The Fours was published by Mapping Mountains Publications on the 24.04.18, with a Hill Reclassifications post then appearing on Mapping Mountains on the 23.07.18, the hill was previously listed with c 20m of drop based on the 406m summit spot height that appears on the Ordnance Survey 1:50,000 Landranger map and an estimated col height of c 386m based on col contouring at 10m intervals and between 380m – 390m on the 1:50,000 Landranger and 1:25,000 Explorer maps. This hill’s deletion is due to analysis of data on the OS Maps website, which is the recent replacement for OS Get-a-map. This mapping has 5m contour intervals enabling the estimated height of the col to be narrowed down, and with an estimated col height of c 388m, based on contours between 385m – 390m, these values give this hill c 18m of drop, which is insufficient for its continued inclusion as a 400m Sub-Four. 400m Sub-Four total decreases by one and confirmed as 147. This hill’s deletion from 400m Sub-Four status was announced when the 2nd edition of The Fours was published by Mapping Mountains Publications on the 24.04.18, with a Hill Reclassifications post then appearing on Mapping Mountains on the 16.07.18, the hill was previously listed with c 20m of drop based on the 423m summit spot height that appears on the Ordnance Survey Interactive Coverage Map hosted on the Geograph website and an estimated col height of c 403m based on col contouring at 10m intervals and between 400m – 410m on the 1:50,000 Landranger and 1:25,000 Explorer maps. This hill’s deletion is due to analysis of data on the OS Maps website, which is the recent replacement for OS Get-a-map. This mapping has 5m contour intervals enabling the estimated height of the col to be narrowed down, and with an estimated col height of c 404m, based on contours between 400m – 405m, these values give this hill c 19m of drop, which is insufficient for its continued inclusion as a 400m Sub-Four. 400m Sub-Four total decreases by one and confirmed as 148. The reclassification of this hill to Four status was announced when the 2nd edition of The Fours was published by Mapping Mountains Publications on the 24.04.18, with a Hill Reclassifications post then appearing on Mapping Mountains on the 09.07, the hill was previously listed as a 400m Sub-Four with c 26m of drop based on a summit height of c 483m which was ascertained from an optical survey from the summit of Baystones (486.9m at NY 40312 05143) which concluded that Wansfell Pike is at least 4m lower, and an estimated col height of c 457m based on col contouring at 10m intervals and between 450m – 460m on the Ordnance Survey 1:50,000 Landranger and 1:25,000 Explorer maps. 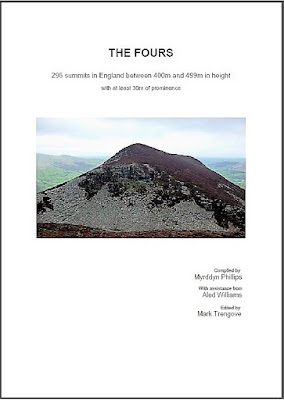 This hill’s reclassification is due to LIDAR analysis of the summit coupled with the 483.717m height given to a buried block in the OS Trig Database and data on the OS Maps website, which is the recent replacement for OS Get-a-map. This mapping has 5m contour intervals enabling the estimated height of the col to be narrowed down, and with an estimated col height of c 453 – c 454, based on contours between 450m – 455m, these values are sufficient to list this hill with c 30m of drop and classify it as a Four. 400m Sub-Four total decreases by one and confirmed as 149. The deletion of this hill from 400m Sub-Four status was announced when the 2nd edition of The Fours was published on the 24.04.18 by Mapping Mountains Publications, with a Hill Reclassifications post appearing on Mapping Mountains on the 04.07.18, the hill was previously listed with c 20m of drop based on the 404m summit spot height that appears on the Ordnance Survey 1;25,000 Explorer map and an estimated col height of c 384m based on col contouring at 10m intervals and between 380m – 390m on the 1:50,000 Landranger and 1:25,000 Explorer maps. This hill’s deletion is due to analysis of data on the OS Maps website, which is the recent replacement for OS Get-a-map. This mapping has 5m contour intervals enabling the estimated height of the col to be narrowed down, and with an estimated col height of c 388m, based on contours between 385m – 390m, these values give this hill c 16m of drop, which is insufficient for its continued inclusion as a 400m Sub-Four. 400m Sub-Four total decreases by one and confirmed as 150. The reclassification of this hill to Four status was announced when the 2nd edition of The Fours was published on the 24.04.18 by Mapping Mountains Publications, with a Hill Reclassifications post then appearing on Mapping Mountains on the 22.06.18, prior to this the hill was listed as a 400m Sub-Four with c 28m of drop based on the 465m summit spot height that appears on the Ordnance Survey 1:25,000 Explorer map and an estimated col height of c 437m based on 430m – 440m col contours at 10m intervals. This hill’s reclassification is due to analysis of data on the OS Maps website, which is the recent replacement for OS Get-a-map. This mapping has 5m contour intervals enabling the estimated height of the col to be narrowed down, and with an estimated col height of c 433m, based on contours between 430m – 435m, these values give this hill c 32m of drop, which is sufficient for it to be classified to Four status. 400m Sub-Four total decreases by one and confirmed as 151. The addition of this hill to 400m Sub-Four status was announced when Mapping Mountains Publications published the 2nd edition of The Fours on the 24.04.18, with a Hill Reclassifications post appearing on Mapping Mountains on the 13.06.18, the hill was previously listed with c 18m of drop based on the 422m summit spot height that appears on the Ordnance Survey Interactive Coverage Map hosted on the Geograph website and an estimated col height of c 404m based on col contouring between 400m – 410m on the 1:50,000 Landranger and 1:25,000 Explorer maps, with the col contours between 400m – 405m on OS Maps, which is the recent replacement for OS Get-a-map. This hill’s addition is due to LIDAR analysis conducted by Aled Williams resulting in a 423.7m summit height and a 403.2m col height, with these values giving this hill 20.5m of drop, which is sufficient for it to be classified to 400m Sub-Four status. 400m Sub-Four total increases by one and confirmed as 152. The deletion of this hill from 400m Sub-Four status is due to LIDAR analysis conducted by Aled Williams and this deletion was announced when Mapping Mountains Publications published the 2nd edition of The Fours on the 24.04.18, with a Hill Reclassifications post appearing on Mapping Mountains on the 07.06.18, the hill was previously listed as a 400m Sub-Four with c 21m of drop based on a 1,427ft (435.0m) summit height that appears on the Ordnance Survey 1:10,560 map and an estimated col height of c 414m based on col contouring between 410m – 420m on the 1:50,000 Landranger and 1:25,000 Explorer maps, with the col contours between 410m – 415m on OS Maps, which is the recent replacement for OS Get-a-map. This hill’s deletion is due to LIDAR analysis resulting in a 432.6m summit height and a 413.5m col height, with these values giving this hill 19.1m of drop, which is insufficient for it to retain its 400m Sub-Four status. 400m Sub-Four total decreases by one and confirmed as 151. This hill’s deletion from 400m Sub-Four status was announced when the 2nd edition of The Fours was published by Mapping Mountains Publications on the 24.04.18, with a Hill Reclassifications post appearing on Mapping Mountains on the 02.06.18, the hill was previously listed with 20m of drop based on the 449m summit spot height that appears on the Ordnance Survey 1:50,000 Landranger and 1:25,000 Explorer map and the 429m col spot height that appears on the Ordnance Survey 1:25,000 Explorer map. 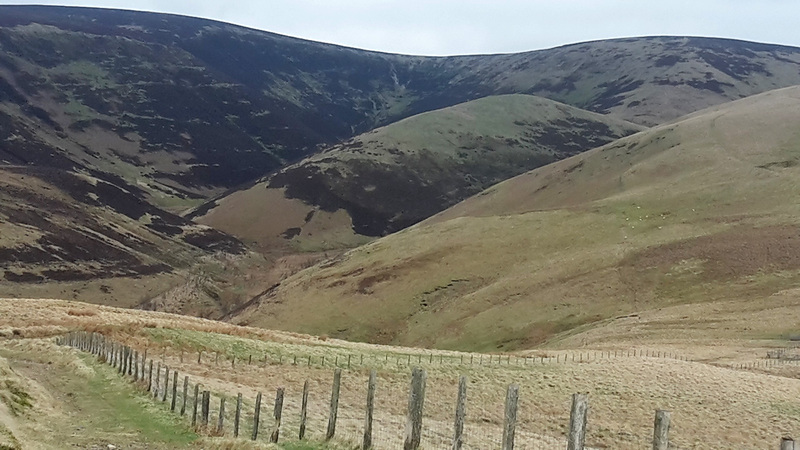 This hill’s deletion is due to LIDAR analysis conducted by Aled Williams resulting in a 449.5m summit height and a 429.9m col height, with these values giving this hill 19.6m of drop, which is insufficient for it to retain its 400m Sub-Four status. 400m Sub-Four total decreases by one and confirmed as 152. The deletion of this hill from 400m Sub-Four status is due to LIDAR analysis conducted by Aled Williams and was announced when the 2nd edition of The Fours was published by Mapping Mountains Publications on the 24.04.18, with a Hill Reclassifications post being published on Mapping Mountains on the 29.05.18, the hill was previously listed with 21m of drop based on the 488m summit spot height that appears on the Ordnance Survey 1:25,000 Explorer map and the 467m col spot height that appears on the Ordnance Survey Interactive Coverage Map hosted on the Geograph website. The LIDAR analysis has resulted in a 486.0m summit height and a 466.1m col height, with these values giving this hill 19.9m of drop, which is insufficient for its continued inclusion as a 400m Sub-Four. 400m Sub-Four total decreases by one and confirmed as 153. This hill’s deletion from 400m Sub-Four status was announced when the 2nd edition of The Fours was published by Mapping Mountains Publications on the 24.04.18, with a Hill Reclassifications post appearing on Mapping Mountains on the 25.05.18, with the hill previously listed with c 20m of drop based on the 429m summit spot height that appears on the Ordnance Survey 1:50,000 Landranger and 1:25,000 Explorer map and an estimated col height of c 409m initially based on col contours between 400m – 410m. This hill’s deletion is due to LIDAR analysis conducted by Aled Williams resulting in a 429.5m summit height and a 409.9m col height, with these values giving this hill 19.7m of drop, which is insufficient for it to retain its 400m Sub-Four status. 400m Sub-Four total decreases by one and confirmed as 154. The deletion of this hill from 400m Sub-Four status is due to the analysis of LIDAR data by Aled Williams and this deletion was announced on the 24.04.18 when the 2nd edition of The Fours was published by Mapping Mountains Publications, with a subsequent Hill Reclassifications post appearing on Mapping Mountains on the 21.05.18, the hill was previously listed as a 400m Sub-Four with c 20m of drop based on an estimated c 431m summit height taken from a small uppermost 430m ring contour that appears on the Ordnance Survey 1:25,000 Explorer map and a 411m col height that appears on the Ordnance Survey Interactive Coverage Map hosted on the Geograph website. This hill’s deletion is due to LIDAR data which gives it a 430.7m summit height and a 412.6m col height, with these values giving this hill 18.1m of drop, which is insufficient for it to retain its 400m Sub-Four status. 400m Sub-Four total decreases by one and confirmed as 155. This hill’s reclassification to 400m Sub-Four status was announced when the 2nd edition of The Fours was published by Mapping Mountains Publications on the 24.04.18, with a Hill Reclassification post appearing on Mapping Mountains on the 18.05.18, the hill was previously listed with c 30m of drop based on the 468m summit spot height that appears on the Ordnance Survey 1:50,000 Landranger and 1:25,000 Explorer maps and an estimated col height of c 438m. This hill’s reclassification to 400m Sub-Four status is due to LIDAR analysis conducted by Aled Williams resulting in a 468.4m summit height and a 440.2m col height, with these values giving this hill 28.2m of drop, which is insufficient for it to retain its Four status. 400m Sub-Four total increases by one and confirmed as 156. The reclassification of this hill from 400m Sub-Four to Four status was announced when the 2nd edition of The Fours was published by Mapping Mountains Publications on the 24.04.18, with a Hill Reclassifications post subsequently appearing on the Mapping Mountains site on the 15.05.18, the hill was previously listed with 28m of drop based on the 419m summit spot height that appears on the Ordnance Survey 1:50,000 Landranger map and the 391m col spot height that appears on the Ordnance Survey 1:25,000 Explorer map. 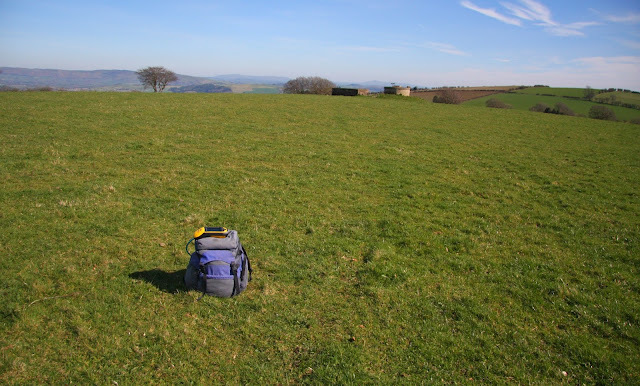 This hill’s reclassification is due to LIDAR analysis conducted by Aled Williams resulting in a 419.6m summit height and a 389.6m col height, with these values giving this hill 30.05m of drop which is sufficient for this hill to be listed as a Four. 400m Sub-Four total decreases by one and confirmed as 155. The addition of this hill to 400m Sub-Four status was dependent upon re-interpolation of Ordnance Survey map data coupled with studying Aerial maps and Google Street View, with its addition announced when the 2nd edition of The Fours was published on Mapping Mountains Publications on the 24.04.18, with a Hill Reclassifications post published on Mapping Mountains on the 13.05.18. The hill once qualified as a P30, but due to quarrying activity its drop value was estimated to be c 12m with details to it appearing in Appendix I in the 1st edition of The Fours (Europeaklist December 2013), however these details have been re-evaluated and the hill is now listed with an estimated summit height of c 417m and a col height of 491m, with these values giving this hill c 26m of drop, which is sufficient for it to be classified as a 400m Sub-Four. 400m Sub-Four total increases by one and confirmed as 156. This hill’s reclassification to a 400m Sub-Four was announced on the Mapping Mountains site on 25.04.17, with the Hill Reclassifications post appearing on Mapping Mountains on the 27.04.17. The hill had previously been listed as a Four with c 30m of drop based on an estimated summit height of c 406m with uppermost ring contouring of 405m on Ordnance Survey 1:25,000 Explorer maps and an estimated col height of c 376m with col contouring between 375m – 380m. The hill was subsequently surveyed on the 25.03.17 by Myrddyn Phillips with the Trimble GeoXH 6000 resulting in a 404.6m summit and 375.6m col height which gives this hill 29.0m of drop which is insufficient for its continued status as a Four. Once in receipt of these details Aled Williams then analysed them against LIDAR data resulting in a 404.6m summit and 375.3m col height which gives this hill 29.3m of drop. 400m Sub-Four total increases by one and confirmed as 155. 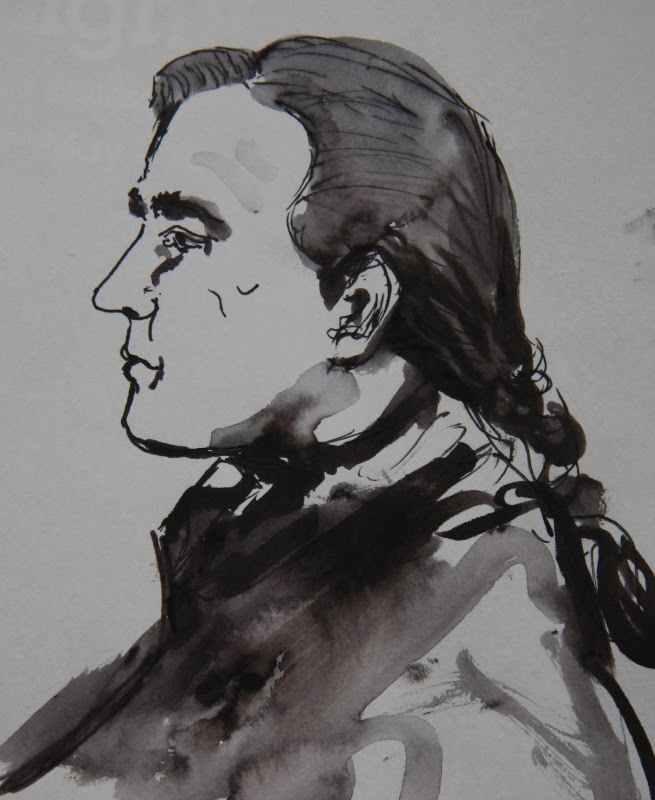 6th January 2014 – Haroldstreet publishes The Fours. 400m Sub-Four total confirmed as 154. 15th December 2013 – Europeaklist publishes The Fours.